Best Digital Pictures Recovery Software, recovering pictures in 3 Steps! Some photographers took photos and then deleted accidentally. These lost pictures are so important for them, so they have to discover an efficient way to recover the lost digital pictures. But how to retrieve these pictures is a great task for card users. Digital Pictures Recovery Pro will display an easy way for you to recover the lots photos. SD card photo recovery process will help you get the missing pictures as soon as possible. Digital Pictures Recovery Pro is dedicated to recovering deleted or lost digital pictures or photos. The program helps you recover lost images that are corrupted or accidentally deleted digital camera or mobile phone memory cards. Digital Pictures Recovery Pro supports all major digital camera brands like Sony, Canon, Nikon, Samsung, Minolta, Pentax, Kodak, Fuji, Sigma, Olympus, Mamiya, Epson and Panasonic, etc. Nowadays, more and more people are crazy about taking photos with digital cameras. With the widely use of digital products, the requirement for recovering photos increases rapidly. 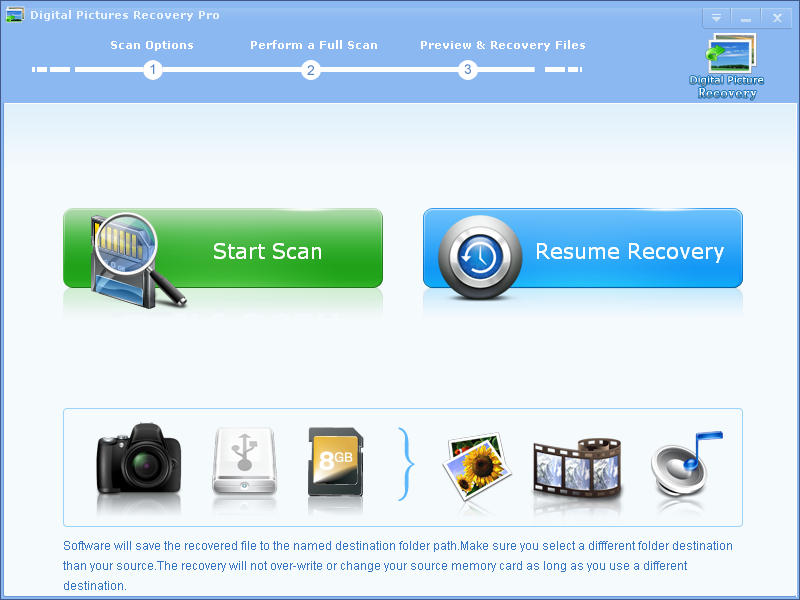 Digital Pictures Recovery Pro is born to help people retrieve their deleted photos. STEP 1 Download Digital Pictures Recovery Proand Install it for free. STEP 2 Run Digital Pictures Recovery Pro. Click [Start Scan], specify the drive letter, file type and destination location. Then click [Next] to start the scan. With Digital Pictures Recovery Pro, people can recover lost photos from any digital cameras efficiently and effectively. On the one hand, Digital Pictures Recovery Pro is easy-to-use photo recovery software. No matter you are a computer novice or an advanced computer user, you can use the software easily. On the other hand, this software performs strong power to recover lost files. It contains four forms of recovery process: Preview Recovery is designed for people to see thumbnail display of recoverable photos or files. Batch Recovery is used to recure multiple files at one time. Safe Recovery is created to recover CF card safe and sound. Moreover, Raw Recovery is the most advanced feature of the software, which strongly proves that the software supports more than 100 different file types. 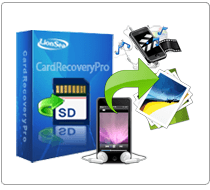 * Digital Pictures Recovery Pro will undelete all type of photos from your SD card or disk.